It's funny to read the dismissal of Jack Stack versus the excitement about Pork Shoppe in the Chicagoland thread. My opinion about Jack Stack's middling okayness is pretty clear, but if it suddenly appeared in Chicago at exactly the quality level it has now, there'd be a 6-page thread about it within the first week. Funny, when I think about Jack Stack's, and compare it to an instance of actually bad 'commercial' KC bbq, Jack's comes off pretty well indeed. Mike G wrote: It's funny to read the dismissal of Jack Stack versus the excitement about Pork Shoppe in the Chicagoland thread. Yeah, but how long before the bloom fades from that rose. It's true that Jack's Stack would be initially welcomed here, or any town with limited Barbecue access. They would probably thrive with customers who don't know any better. Heck, go to a small, rural Midwestern town where they don't have, or are not familiar with good pizza, thick or thin, and you will find a Domino's/Little Caesar/Papa John's/etc. franchise that is heralded and beloved by the community for its exceptional pies. It's all relative folks. In a Barbecue Destination town like Kansas City, Jack's Stack is a mediocre creator of Barbecue that has made itself a primary player by accentuating the importance of its total experience, including decor, safe suburban locations with plenty of parking, over-hyped (IMO) signature side dishes, and one unique meat offering; lamb ribs, that no one else in town has on their menu. As I said in my previous post, it's tough to find really bad 'Que in KC. That's because, with standards as high as they are in that town, the really bad ones fall to the wayside fairly quickly. Jack's Stack has been around long enough, and does a just good enough job to remain established as an unquestioned icon in the community. As teatpuller put it so perfectly on the previous page, "It's for those who are not in the mood for an adventure." For anyone who has braved the wilds of Kansas City, Kansas (an actual conversation between me and my brother on a long ago business trip to KC: "We just crossed the state line into Kansas" "Oh, I wondered what that smell was..."), or has gone into the less desirable neighborhoods of KCMO, you know there is better Barbecue than Jack's Stack to be had in that metro area. 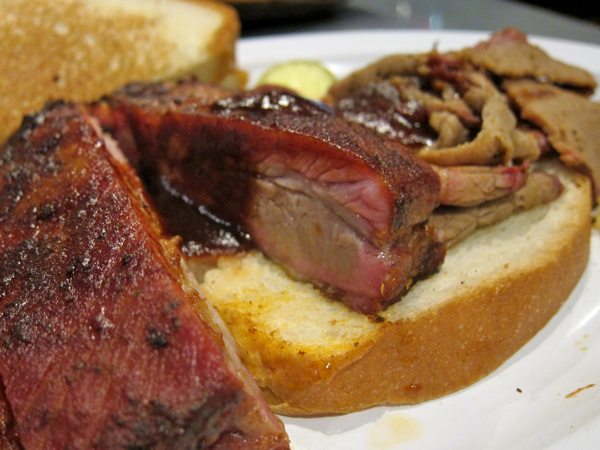 As Chicagoans become better Barbecue Educated, their tastes and expectations change. There will always be unadventurous types who will support Gale Street Inn, or Twin Anchors. But, those in the know will deal with the limited parking and long lines at Smoque. They'll go down to the south side and put up with eating on the trunk of their car at Lem's or Uncle John's. And with any luck, they'll drag themselves to the far flung corner of Belmont and California as The Pork Shoppe (hopefully) gets their act together. Speaking of lamb (as we were), if I be not mistook, you can get a lamb-sand at Gates. Greasiest thing I *ever* tasted, but MAN! was it loaded with flavor! That was all I ever ordered at Gates, bcz it was just better than anything else on the menu. Buddie, do you know whether they still have it on the menu? I believe Gate's still offers mutton on their menu. Jack's Stack, to my knowledge, is the only one in town who serves lamb ribs. As for my preferred choice at Gate's, on those rare visits, I would have to say the brisket ( I'll definitely try the mutton), a side order of their beans with burnt ends, and a heap of their massive fries. I skip the ribs at Gate's; they must have come off an anorexic pig; a more meager set of bones I have yet to see. Gate's, IMO, falls into the "average" category along with Jack's Stack. Like Jack's (and Arthur Bryant's for that matter) they have managed to withstand the test of time, achieving iconic status in their insulated world. Think Uno's, Due's, and Gino's East for a local comparison. Tourist Pizza/Tourist Barbecue. But again, what might be considered pedestrian in one community will be welcomed and cherished as brilliance in another. BuddyRoadhouse wrote: I believe Gate's still offers mutton on their menu. Jack's Stack, to my knowledge, is the only one in town who serves lamb ribs. Actually, RJ's also serves lamb ribs. I actually preferred the ones at RJ's, though I wouldn't take that to mean much as the experiences were quite different and separated by a long period of time. Probably the last thing we need here are more opinions on KC barbecue. Especially opinions based on single visits to several places last summer and the summer before that. My excuse is I'm only now getting around to cleaning up my files, chipping away at a huge backlog of old posts. You've been warned. It's been so long since my visit to Oklahoma Joe's (the one in Olathe) that it has a new name now—Joe's Kansas City. From the suburban mall location to the ostentatious display at the entrance, I was primed to dislike the place. Being herded down the cafeteria line, having to deal with the disinterested meat slingers didn't help. It had been a long, hot day and I was tired. But I was in an air conditioned room with some pretty good smells so began to perk up a little. A bite of pork sandwich...somewhat dry meat overwhelmed by the roll...nice well-integrated smoke flavor though...not great but not bad at all. Then a spoonful of beans...awfully heavy on the sauce and fragments of barbecue...hmm, not bad at all...another spoonful...okay, really quite good. Brisket too thinly sliced and kinda dry looking...really good flavor though, even without all the dripping fat like in Texas...the more I ate, the more I liked it. Baby backs aren't my preferred rib, but if they were all this good I could understand why people get so excited. Seemed straight out of the smoker. Really nice effort. I left as a grudging admirer. No, not everything was perfect and, yes, the whole operation seemed pretty soulless, but being able to crank out that quantity of good barbecue is impressive. When we visited Q39 last August, it had been open only a few months. Of course, a lot could have changed. 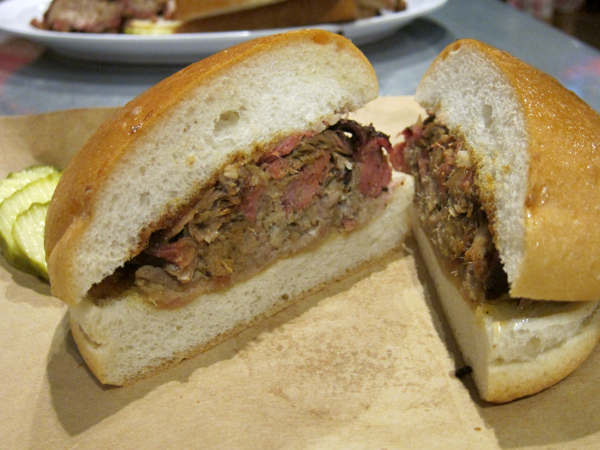 We had a pork sandwich, burnt ends, brisket, potato salad and cassoulet-style beans. 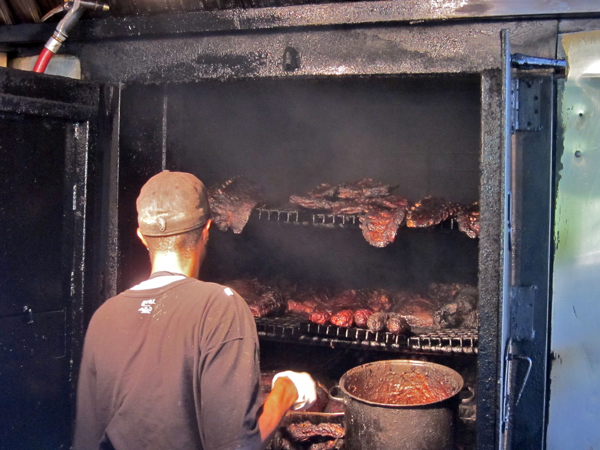 It's easy to summarize the barbecue: everything was remarkably similar in flavor and texture. I won't go into detail since things have probably changed, but it all seemed like it sat in a steam cabinet for a while (what looks like crisp bark, wasn't). I was ambivalent about both the nontraditional beans, with their un-BBQ-like flavors, and the unusual take on potato salad, with sour cream and tarragon dressing. It's nice they're trying something new, but I didn't love either side. Unprepossessing, that's the word for LC's. 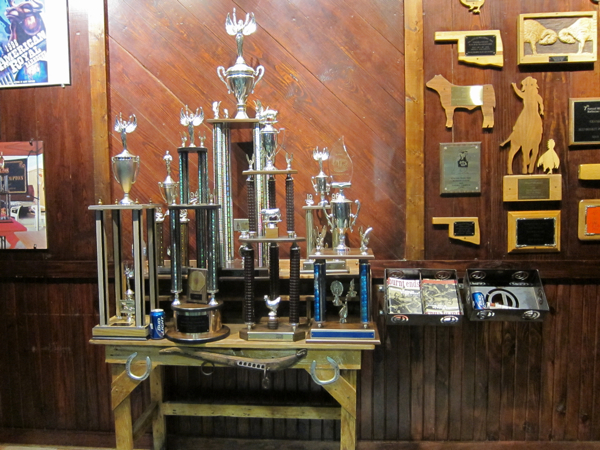 No competition trophies, just a few taxidermied fish decorating the dining room. 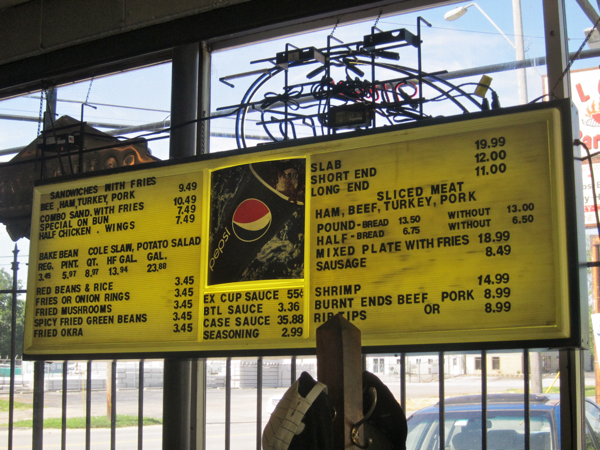 I'd dreamed about visiting LC's for decades and at last there I was, gazing into that beautiful vault of meat. For whatever it's worth, we were the first customers of the day. 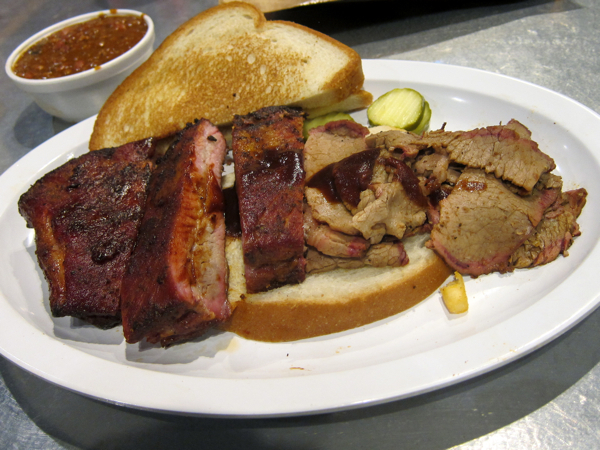 An order of the legendary burnt ends—half pork, half beef—and half a slab seemed about right. That's pork in back, beef in front. 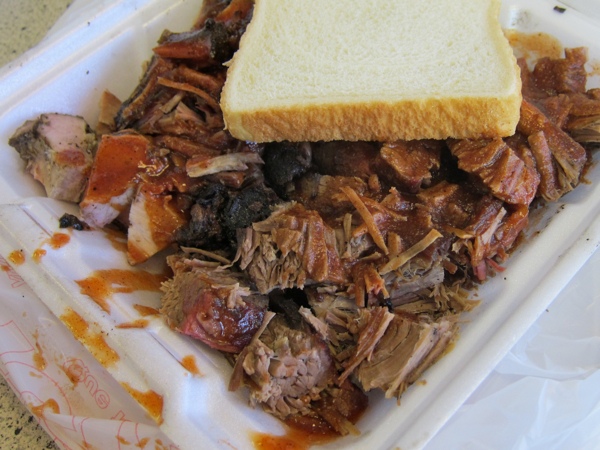 I can't put it any other way, the pork was the worst barbecue I've had anywhere in three visits to KC. It had a distinct petroleum taste and an unpleasantly firm texture, as if it needed a few more hours in the smoker. But the beef was spectacular, henceforth defining burnt ends for me. Those crisp-barked, smoky, juicy-but-not-fatty nubs approach my idea of barbecue perfection. The blackened ribs looked like they'd been forgotten in a back corner of the smoker. I was expecting the burnt ends to be good but the ribs caught me by surprise. Some of my favorite ribs ever. The black crust was great, but the innards were somehow not dried out. Nearly all the fat had rendered away, leaving dense, tender, succulent meat. I can't imagine the ribs are always quite this good. It's experiences like this that make all those years of mediocre barbecue experiences worthwhile. I can't wait to return to LC's, but will try not to have unrealistic expectations. You've got to go to Joe's original in the gas station to find the soul, unfortunately. The fries at both Joe's and LC's are marvels of their (very different) kinds, IMHO. Did you try either? Glad you finally got to LC's, and that it was worth it! I too am a fan of L.C.s and of the original gas station Joe's. 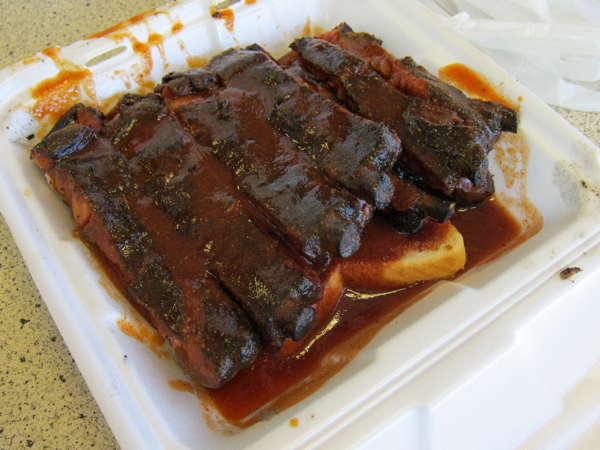 On a recent visit the ribs were simply cooked to perfection. While I prefer brisket in thick slices, Joe's paper thin slices were outstanding on the day. 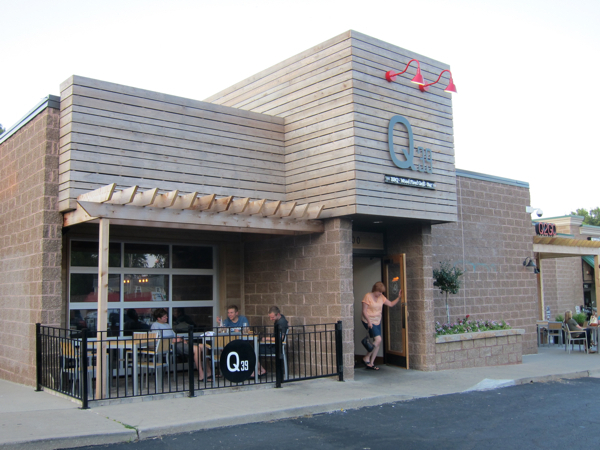 Have a dinner next month in KC, due to size of group I had to choose a place like Q39 over LCs. That said, I will try to hit LCs to be able to compare and of course will report back on Q39, with the group size we should be able to try everything. 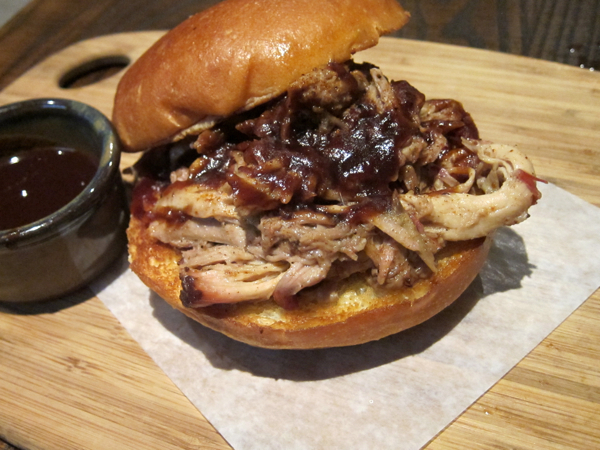 Q39 is not our favorite KC 'Que spot, but you definitely won't be disappointed. Be sure to try their Smoked Fried Chicken. The name says is all. The chicken is smoked first then fried. Very tasty. The one drawback is that the coating doesn't stick very well to the skin which is already quite crispy from the smoking process. Keep in mind Q39 is not your typical Greasehouse. It's kinda like the difference between Harold's Chicken Shack and White Fence Farm, but not quite. Q39 is upscale hipster BBQ. Lotsa pork pie hats and goatees populate the room. We felt like the service matched the vibe, but maybe it just seemed that way to us because we've now entered geezer-dom. If we were 30 years younger we might have dug the scene a little more. All that said, the food is good, the room is clean and attractive, if a little noisy. Exposed brick walls, cement floors and the wood plank ceiling tends to send the sound bouncing around. Enjoy, and definitely try to make the trip to LC's. BuddyRoadhouse wrote: Be sure to try their Smoked Fried Chicken. The name says is all. The chicken is smoked first then fried. Very tasty. The one drawback is that the coating doesn't stick very well to the skin which is already quite crispy from the smoking process. Yeah, I get it, and I'm certainly not arguing with you, since I'm the one who brought it up. But it's not like the coating runs off somewhere when it falls off; it's still there on the plate waiting to be enjoyed, just not in the manner one typically expects when eating Fried Chicken. Geo wrote: Speaking of lamb (as we were), if I be not mistook, you can get a lamb-sand at Gates. Greasiest thing I *ever* tasted, but MAN! was it loaded with flavor! That was all I ever ordered at Gates, bcz it was just better than anything else on the menu. Buddie, do you know whether they still have it on the menu? I was just at Gates this past Sunday and they no longer serve mutton, incredibly bummed after reading your post Geo. So I ended up ordered a side of burnt ends & the sausage link. Suggestion, ask for sauce on side, the burnt ends were delicious in their own right and a couple drops of sauce would highlight. The link was fine ground beef link, really nice spice/heat/flavor. I'd go back to Gates for both those items again while lamenting no mutton offerings. 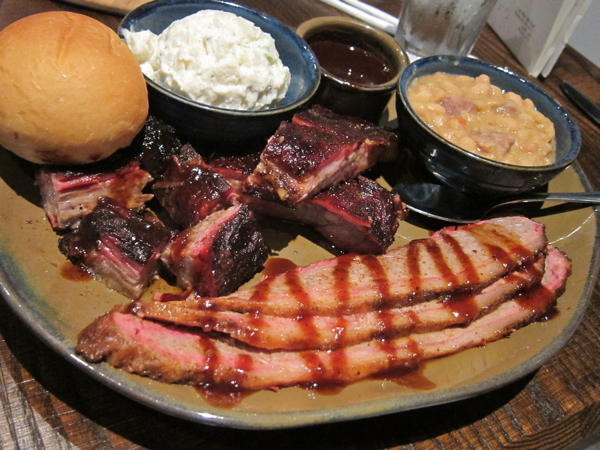 BuddyRoadhouse wrote: Q39 is not our favorite KC 'Que spot, but you definitely won't be disappointed. Glad you enjoyed Q39. As I stated, the food is fine, it's just the general vibe that doesn't appeal to us. When it comes to 'Que, give me the grease slicked floors of LC's over the carefully manicured ambiance of Q39 any day. As for the mutton situation at Gate's, it was never a chain wide option; only certain locations offered it. When you say they no longer serve it, is that an absolute for all stores, or just the one you visited? BuddyRoadhouse wrote: Glad you enjoyed Q39. As I stated, the food is fine, it's just the general vibe that doesn't appeal to us. When it comes to 'Que, give me the grease slicked floors of LC's over the carefully manicured ambiance of Q39 any day. I didn't ask that question re: Gate's mutton as I didn't realize mutton was not served systemwide. The location I stopped by stated that they stopped serving mutton about 2 years ago.